We love tweed here at Robinson’s Shoes. Those who choose to wear tweed, whether that is in a formal or casual setting, exude a certain gentlemanly class. We’re taking a deep dive into this fabric's history and exploring its journey from function to fashion, and how you can wear and style it today. Tweed is woollen twill cloth woven in herringbone, speckle, houndstooth and checked patterns. Traditionally hand-woven on a loom. Today the entire process is mechanised, but the process is largely the same. Its origins of tweed can be traced back to rural Scotland. Specifically to a valley of the River Tweed, where is supposedly got its name. An interesting theory regarding the origin of the name comes from the misreading of tweel (an old Scots word for twill). In 1831, a London Merchant misinterpreted the handwriting on an invoice for the “tweels”, understanding it to be a trade name taken from the textile area in Scotland, River Tweed. The material has been advertised as Tweed ever since. Whatever the origin of the name, the material back in the 19th century was pretty much the same tweed as we know it today. Traditionally tweed was a workingman's cloth with farmers wearing it to keep warm and dry on the Scottish Highlands. It became a fashionable cloth in the 1820s and 1830s. Used for upper-class country clothing like shooting jackets. It even became popular among the Edwardian middle classes who associated it with country pursuits like pheasant or grouse shooting or hunting and fishing. Even though it was generally associated with masculinity, women even enjoyed the cloth for dresses, which is testament to its quality. It’s easy to get confused about types of tweed as there are so many. Take a look at the image below for some popular types. Harris - Harris is probably one of the most famous brand name Tweeds. In 1909 The use of the name was protected. Now only hand-spun and hand-woven products of 100% wool from the Outer Hebrides are allowed to use the Harris Tweed trademark. It is a soft and supple cloth, often flecky and colourful. Donegal - Is an example of geographically named tweed. It is hand-woven and manufactured in County Donegal, Ireland. The fabric is coarse which produces a rustic look. Saxony - Manufactured in the UK from high-quality merino wool initially obtained in Saxony, Germany. It is a very soft fabric with a short pile. Cheviot - Named after a breed of white-faced sheep first kept in the Cheviot Hills of Northumberland and the Scottish borders. It is a soft, stiff and very durable type of tweed. Shetland - Was originally woven from sheep raised on islands of the same name. The wools from these sheep are exceptionally fine with a soft, delicate and a slightly shaggy finish. Tweed has adapted to reflect the modern man’s style. Coming in different cuts and designs. The reason tweed has stuck around for so long is simple, it is every bit as practical and hardy as it was all those years ago. So now that we know that tweed is no longer reserved for the landed gentry or farmers, how do we wear this revered material in 2018? In a nutshell, tweed is one of menswear’s certified all-rounders. Working just as well in the form of a blazer worn with a button-down and jeans, or as in the shape of a three-piece suit. Tweed suits can be a real statement piece. But wearing a wrong cut of suit or the wrong colour can look stuffy and unflattering. Avoid the traditional earthy tones like browns and greens. Instead, opt for fine weave blue navy tweed suit paired with a light shirt, patterned tie and oxblood double monk-strap shoes. To turn the dial up on this office-appropriate outfit, pair your tie with a pocket square and add a matching waistcoat for the perfect wedding look. We believe the best place to start for anyone wanting to try his hand at tweed, is to start with a basic key piece. A grey Herringbone blazer is a great choice for the colder weather and is an all-round versatile piece. For an excellent smart casual style, try combining a grey tweed jacket, with a crisp button-down shirt and add a pair of dark wash denim jeans to stop the outfit from becoming too formal. Complete the look with suede chocolate Chelsea boots, and a matching suede belt. For autumn/winter try adding a checked scarf (like this one from Magee 1866) to add a pop of colour. Another way to subtly incorporate tweed into your look is to try pieces with subtle accents. Such as shoes! Barker embraces their traditional English roots with these Barker Jackson and Baker Dowd derby shoes. Constructed from contrasting leather and tweed, these are truly unique shoes that are sure to brighten up any wardrobe. These shoes would work well with both formal and casual looks. When paired with matching tweed accessories it really ties the whole outfit together. Tweed is the equivalent of a statement colour pop. Just a small amount goes a long way to finishing off an outfit. There are many different accessories out there that come to mind when we think of tweed. The first being flat-caps. Flat caps, unlike the bolder fedora, make a softer statement that is easier and less intimidating to pair with a range of autumn and winter outfits. We’re seeing this workingman’s hat more in mainstream fashion. Partially thanks to shows like Peaky Blinders. We can’t give credit to the show alone, as this style has been around for centuries, and we are just glad to see it is having a revival. Another dapper accessory for those wishing to make a statement is a tweed bow tie. It is important to note that bowties come in many different fabrics, shapes and colours, and that there are a few rules to follow to make sure you look sharp when styling a bow tie. It is best that you create contrast with the other fabrics in your outfit. For example, it would be a good idea to pair a thick textured bowtie, with a fine/refined fabric blazer. To keep the bowtie the main focus of the look, opt for button down collars. Tweed scarves are a great opportunity to bring colour to a monochrome outfit, they have the added bonus of being very practical. Plus they provide a wide range of style options by simply folding the scarf in a different way. Hat: Hata Vintage Cap – Signature Check from Robinson’s Shoes, Scarf: Red, Navy & Grey Herringbone Patchwork Scarf from Magee 1866, Bag: Caledonian Satchel by the British Belt Company from Robinson’s Shoes Bow Ties: Hata Brown Speckled Bow Tie, Hata Charcoal Speckled Bow Tie from Robinson’s Shoes. The bottom line is this; tweed has managed to stay true to its heritage, yet still adapted over the years by acknowledging the need for lighter blends and more modern colours. It lends itself to many looks, both formal and casual and is ultimately one of the most versatile options in men’s fashion today. 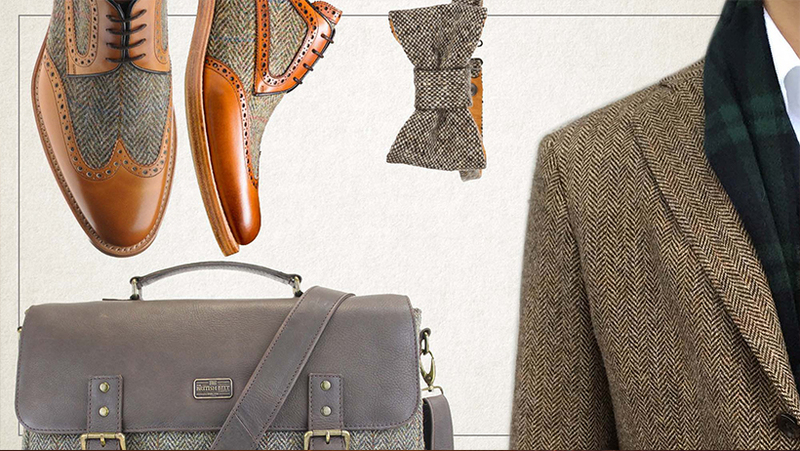 Discover our passion for tweed by browsing our quality accessories. Do you know your Oxfords from your Derby shoes?